These mens incontinence underwear are for washing over and over again. 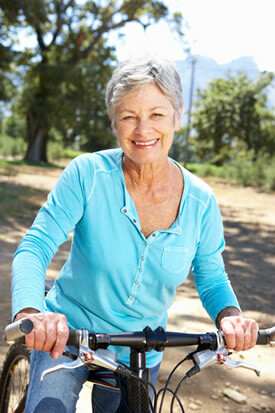 For light to moderate incontinence, see products such as the Men's Free and Active Brief with Built in Absorbency (light) or the Salk Men's Reusable Heavy Brief (moderate). For heavier men's products, go to our For Men's area. IDiaper carries mens briefs - reusable mens incontinence underwear and even covers. Some of these products look like regular underwear, but are actually a light to moderate incontinence product. For a person with this level of incontinence, this product makes it so that it doesn't seem like the person is wearing a diaper - they're like regular underwear. Simply slip the mens incontinence underwear on and then go. It is important to change them when used, but other than that they are just like regular underwear. There are incontinence covers in this section too. 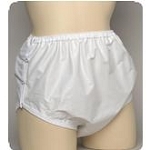 These men's incontinence underwear have a built in absorbent pouch that absorbs leakage. Made for a person with light to moderate incontinence, this takes away the labor of buying pads and taking them in and out all the time. Another use for these is to use them on the go when there isn't much time to do something different. These are a reusable products, which means you wash them and reuse them. This saves the landfills, making them eco-friendly products. iDiaper carries both briefs and boxer shorts. Some of these products even have a functional fly feature. Some of the mens briefs that are washable already have a washable pad attached, while some have the pouch where you can add your own pad of choice. The pant covers in this section can be added for the extra protection you feel you will need. These are also a washable product. The Men's Free and Active brief is a premium brief with the look and feel of regular underwear. This is a product that has a built-in multilayered absorbent padding. It features a stay-dry lining for reliable protection. You can add extra pads if additional absorbency is needed. They are washable and latex-free. The Salk Reusable Briefs have the look and feel of regular underwear yet they are really an incontinence product for men. This product also features a patented moisture management control panel that pulls the moisture away from the body. They also feature a fully functional fly. These briefs will hold approximately 6 ounces of liquid. The outer shell is cotton and the inter fabric is a cotton/polyester/nylon blend. They are washable which is a money-saving and environmentally alternative to disposables. The Sir Dignity Men's Brief is made of a cotton blended material. This is the type of brief you can add the type of pad you required. The moisture-proof pouch holds your pad in place for your leakage protection. 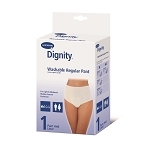 This product can be used with the Dignity pads for light protection. For heavier protection, use the pads designed for the added extra protection. This product is latex-free. The Dignity Men's Boxer Shorts are 60% cotton / 40% polyester. 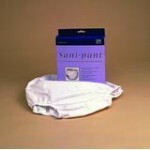 These incontinence products for men feature stretch elastic waist, fly front and special soft floating pad support. They are designed to be used with the ThinSerts or Briefmates Guards. The wide elastic waistband gives a secure and comfortable fit. They are machine washable and come in an attractive plaid. So this is most of our men's underwear and covers. Please take your measurements carefully, then chose your size using the appropriate sizing chart for the product. If you have any questions, please call our customer service representatives (866-559-0353). They are there to make suggestions, help with product selection and answer your questions.